All lessons are tailored to your needs depending on age and level. If you want to be able to strum a few chords at a get-together or if you want to study classical guitar we will discuss and devise a lesson plan with set goals in mind. 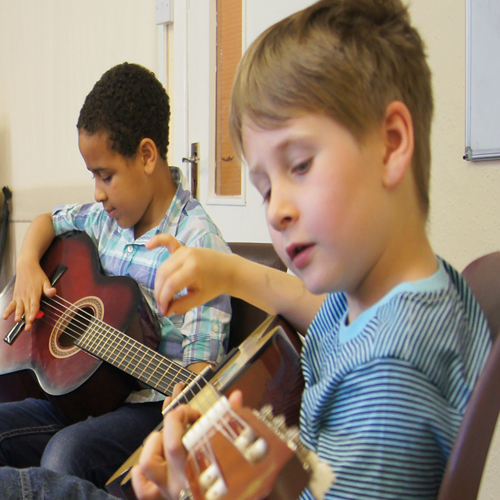 Group lessons are perfect for children as they offer a fun way of learning the instrument with a patient teacher who has been Garda vetted. Skype lessons are also available. Save yourself the time it takes to travel to a lesson and learn from the comfort of your own home. Get in touch with me to discuss how this can be arranged. During your introductory lesson we will discuss your goals and work out a lesson plan and practice schedule. Also any questions you might have about your instrument will be answered or if you need any advice on purchasing a new instrument this will all be covered. Each lesson is a new challenge and it is really exciting to see myself progressing. Excellent teacher.... well prepared classes and good progress over 5 weeks. With a Licentiate diploma from Trinity College London in Classical Guitar performance Francis can help you achieve success in your grade exams. If you would just like to be able to strum a few chords or impress your friends with some complicated fingerpicking, lessons for all levels are available. Learn classic riffs from guitar legends, techniques like hammer-ons, bends and slides and how to create your own solos. Learn how to record music in your own home using software such as Cubase and Reason. Get a professional sound using effects and EQ. All aspects of Leaving Cert Music covered, from music theory to preparation for the practical and technology parts of the exam.